Imagine an adventure that offers the opportunity to come face to face with wild Asian elephants, leopards and Sloth bears and to have the chance to be in the water with Blue whales, Sperm whales, dolphins, Manta rays, Whale sharks and schooling reef sharks. Join us on an extraordinary wildlife expedition to Sri Lanka and the Maldives, two Indian Ocean gems which are listed as some of the world’s top biodiversity hotspots. 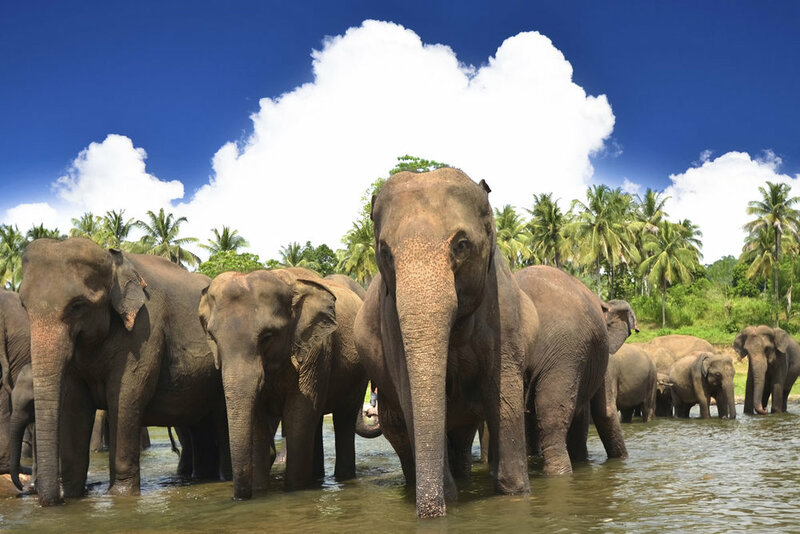 Experience the most incredible national parks guided by the best local experts and witness diverse landscapes, tantalizing cuisine and rich culture in Sri Lanka. We have secured special permits for a once-in-a-lifetime opportunity to snorkel with Blue whales and Sperm whales, a marine experience without equal. Explore the Maldives, one of the world’s most pristine marine environments, onboard our privately chartered luxurious yacht. 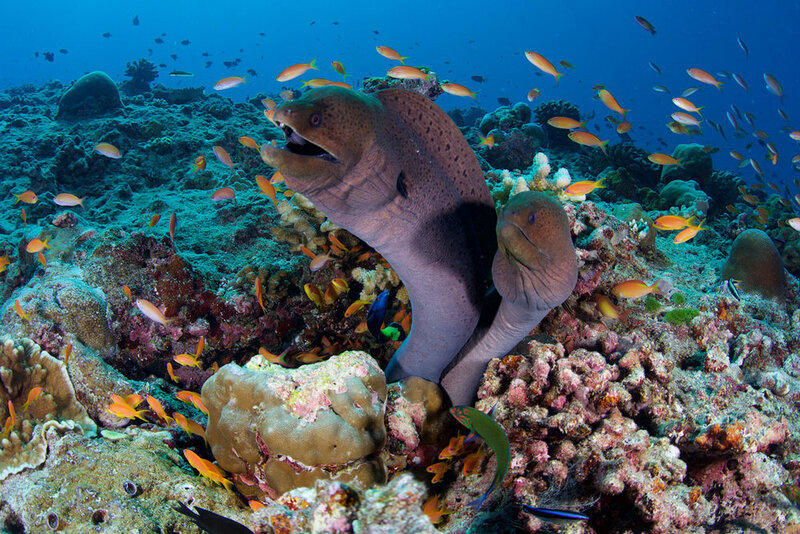 A diver and snorkeler’s paradise, tidal currents flushing through the Islands bring a constant food source, sustaining spectacular coral growth, which in turn supports an extraordinary abundance of over 1000 fish species. Get up close and personal with majestic Manta rays, sharks and Whale sharks during peak season. The Maldives islands, with their palm-fringed white-sand beaches and warm turquoise waters, are your perfect tropical island getaway. When not exploring the colorful coral gardens, big wall drop-offs and current swept channels, you’ll be pampered with fine dining and a wonderful spa experience onboard our luxurious yacht. Join Wild Earth Expeditions Expedition Leader/Dive Instructor Cynthia Gneiser and our Marine Biologist/Snorkel guide Robin Aiello on this wonderful expedition. For the ultimate Sri Lanka experience be sure to join the “Cultural Splendors of Sri Lanka" pre extension to experience the cultural highlights and riches, ancient architectural wonders, stunning landscapes and delicious cuisine of Sri Lanka. 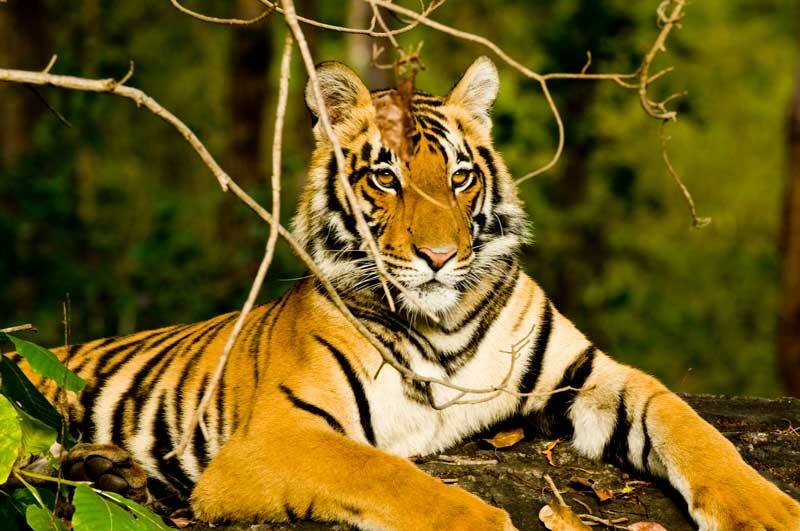 If you prefer wildlife, join the “Kanha Tigers & Jungles of India” pre extension to see tigers and wildlife of central India at Kanha National Park. If you want the “Ultimate Asian Wildlife Adventure” join the Quest for Snow Leopard trip right before this. Why not finish your expedition in a stunning overwater bungalow on a luxurious Maldivian island? Catch a scenic seaplane flight to 5* Mirihi Island Resort, a tiny tropical island paradise surrounded by white sand beaches, swaying palm trees and azure seas. Dive and snorkel the pristine house reef teeming with fish life, treat yourself to delicious cuisine in one of the fine restaurants and get pampered at the Spa. Want to spend some more time in the Maldives after the expedition? In the warm waters of the azure Indian Ocean lies a tropical dream island – Mirihi Island Resort. This emerald gem is just 350 meters long and 50 meters wide with palm-fringed beaches and sand as soft as powder, inviting you to leave your shoes behind for the duration of your stay. A winner of the “Luxury Hotel Awards”, Mirihi Island Resort is an idyllic tropical island paradise boasting a vibrant house reef only a few steps from your over Water Villa. Fill your days with exploration of the surrounding reefs with an excursion to Manta point, glide over pristine reefs on a catamaran, sail to the edge of the atoll in search of whale sharks, or sip a cocktail on a sunset cruise with the possibility to see playful dolphins. Go on a guided night snorkel, be whisked away for a private picnic and delight in delicious cuisine at one of the 4 restaurants and bars. Work out at the gym or indulge in a massage at the Dhonveli spa. Choose between an over Water Villa or a Beach Villa, all with designer furnishings, king size or twin beds, air conditioning, free WiFi. 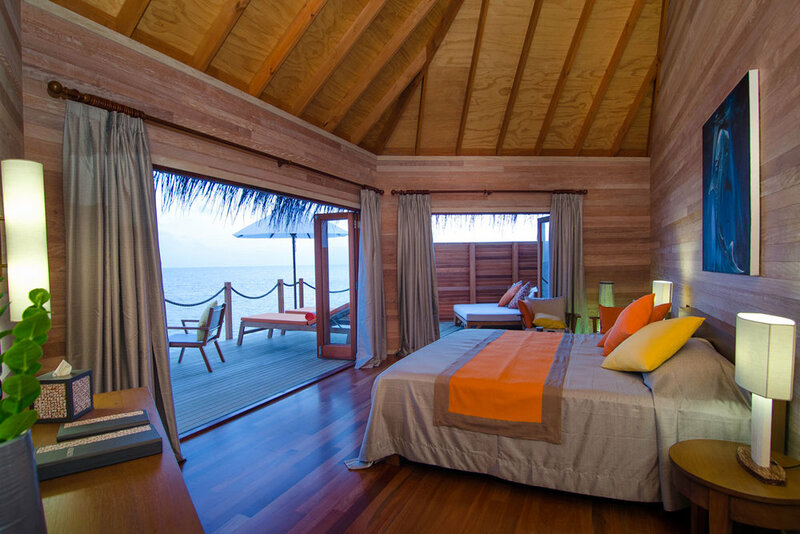 The Water Villas will spoil you with their spacious, luxurious en-suite bathrooms overlooking the ocean. Step outside on your private deck and relax, or slip into the ocean with direct accesses to the house reef, each balcony has been designed to guarantee complete privacy. Beach Villas are dotted around the island, with private sundeck, an open-air shower and direct access to the beach, equipped with sun-loungers. If interested in adding some time at this luxury island resort after the expedition, contact us for details and pricing. 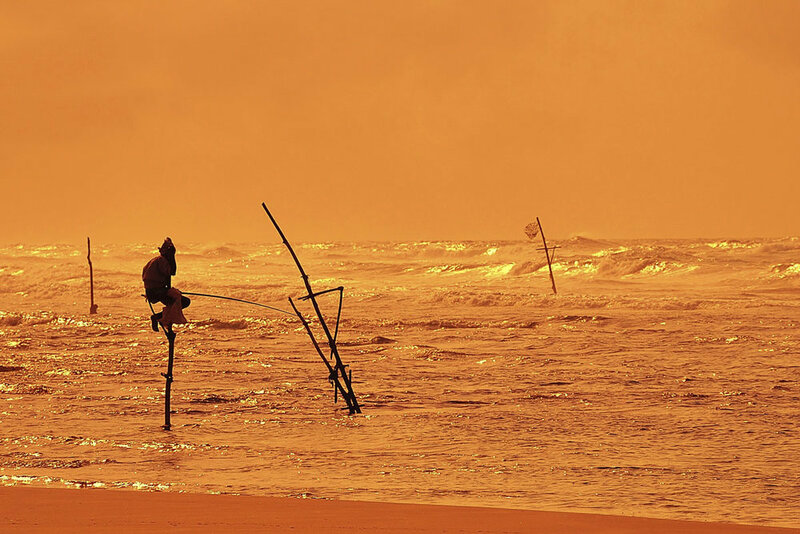 Explore Sri Lanka’s rich culture, tantalizing cuisine and fantastic national parks. 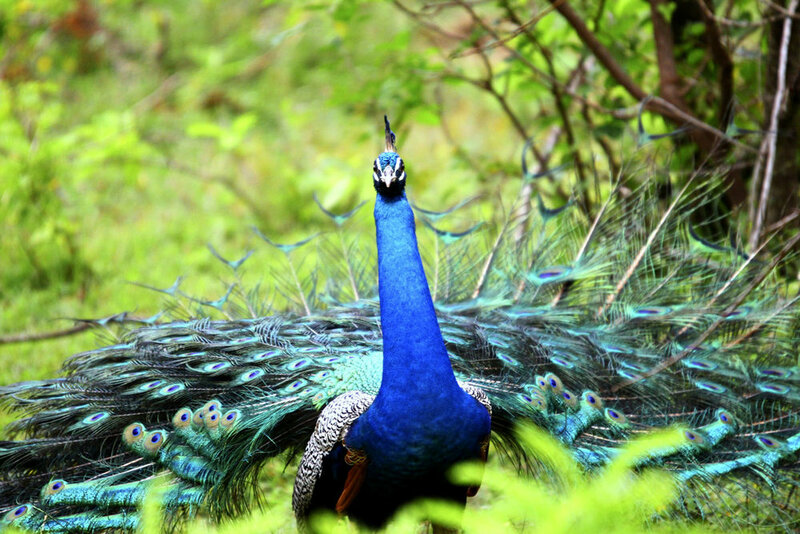 See wild leopards, sloth bears, elephants, deer, langurs and a wide variety of birds. Be one of the very few to snorkel with a Blue whale and/or Sperm whale. Sail amidst the maze of reefs and islands in the Maldives on a luxurious yacht. 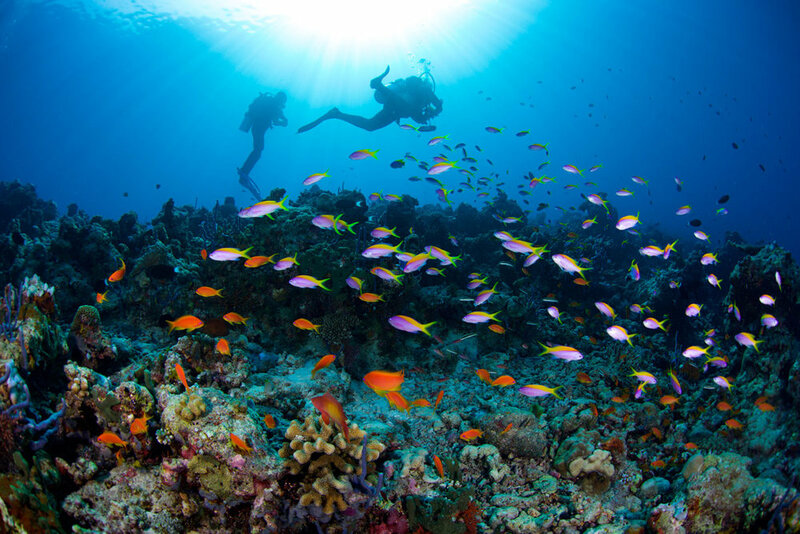 Dive and snorkel the pristine reefs and best dive sites of the Maldives. Swim alongside a giant Whale shark, Manta rays, sharks and turtles. “Cultural Splendors of Sri Lanka” or “Tigers of Kanha, India” Pre Extension options. Add a luxurious 5* resort island stay, surrounded by azure waters and great house reef. We can shape this island add-on to your desire. Contact us for pricing and details. Built in the Maldives in 2005, this stunning yacht is in a class of its own. Owned by a young dynamic French couple that have lived in the Maldives since 1990, this unique 33m/110-foot wooden vessel boasts only seven modern, spacious double occupancy Staterooms and can accommodate up to 14 guests. The luxurious cabins feature 2 Master Staterooms (2 slightly larger forward cabins with a lower double bed and upper single bed) and 5 Deluxe Staterooms (with a single and a double bed). All cabins are air-conditioned with modern and comfortable interiors and fittings, en-suite bathrooms, mirrored wardrobe, bath robes, toiletries and fresh bath towels daily. In addition to the open-air dining area, a modern and comfortable saloon features alongside an elegantly designed indoor dining area and bar. There is a large HDTV screen in the main area for daily recaps and presentations. Unwind after your dives whilst enjoying a sundowner on the spacious sundeck or pamper yourself in paradise with a massage. There are 3 paddle boards available for use and 3 dives are offered each day. WiFi internet is available at a cost. No laundry service onboard. 10 dedicated crew members will take care of your needs while onboard. The MV Ocean Divine has been designed and constructed based upon Lloyds Standards, the leading international body of maritime safety standards. Thus aboard the yacht, the crew have been specially trained in all aspects of safety, emergency and evacuation procedures. The yacht is equipped with the latest safety features including Oxygen, well equipped 1st aid kit, Life Rafts, Life Jackets, Fire Extinguishers, Smoke Alarms, Emergency Long Distance Radios, and Satellite Phones.